A strikingly large and colorful species; nymphs can appear as if dusted with bright pink powder. Widespread, but little is known of its hosts and habits. L. abdominalis abdominalis adult. Dried museum specimen from the University of Tsukuba. Physical description: Around 14-21 mm in length. Dorsal side is bright red, except for black membrane. Large, rounded pronotum that appears to bulge outward laterally. Ventral side is black with red margins. Appendages are black. Physical description: Similar to taprobanensis (see below) except head has a slight reddish or brownish tint and the scutellum is black. Also, there is a large black patch above the pronotum and the membrane has a grayish or metallic green tint. 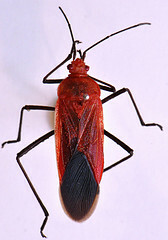 Leptocoris abdominalis taprobanensis adult. Dried museum specimen from the University of Tsukuba. Physical description: Same as abdominalis except ochre colored in all places where abodominalis is red. Leptocoris abdominalis has been found in Myanmar, Vietnam, and Australia but the exact locations of where it was collected are not known. Carroll, S.P. & Loye, J.E. (2009): Anthropogenic adaptive radiation of soapberry bugs in a biogeographic context. Gross, G.F. (1960): A revision of the genus Leptocoris Hahn (Heteroptera: Coreidae: Rhopalinae) from the Indo-Pacific and Australian regions. Records of the Australian Museum 13, 403-451. Ho, H.Y., Hsu, Y.C., Ho, J.Z., et al. (2006): The Dorsal Abdominal Glands and Exuviae of Leptocoris abdominalis and Leptocoris augur (Heteroptera: Rhopalidae). Arthropod Biology 99, 859-864.